Do you know that moment when you adjust the thermostat to a decent 72 degrees Fahrenheit (22 degrees Celsius) or less to keep the heating bill from going through the roof during winter? Doing that I often recall the home where I grew up. I never had my own room, neither prospects or expectations to get one. I didn’t even have my own bed, but I had a very warm house. My grandmother will rather warm-up one single room in the house and keep feeding the wood burner till the room was hotter than summer. At school, the rooms were very warm as well. I must have been one of the last generations remembering a very warm classroom in the elementary school. That changed as Ceausescu’s savings plan took off to pay what he called the national debt. However, the essence of the memory that I want to share is this straight-forward association between very warm spaces and the weirdly unnoticeable presence of the flu during winter. I surely wasn’t immunized. I hated needles as a child. Yet, one can’t rely solely on a perfect immunity. It must have been more than that! As a teenager, I recall colder homes and terrible jokes about the communist regime. I moved to live with my mother in an apartment building that had minimal to no heating. I was wearing a minimum of 10 layers and the living room was still so darn cold that one morning I found an ice crust on the water surface of my fish tank! Recalling the flu season of that time, I can count many instances of flu with quick spread and ravaging damages. It didn’t change until the Revolution when the one in charge with the central heating must have been either shot dead or taking revenge on the communists because the heating in the same apartment building raised up to what I remembered from my grandmother’s home, meaning hotter than summer. The heating luxury continued during and after the Revolution, initially with a minimal cost impact, then noticeable and then concerning as the years passed. However, during all this time I noticed again less and less flu. Establishing a life in the United States once the third millennia started, I slowly adapted myself to having air conditioning in the summer and constantly lower living temps over the winter. Reading flu reports every year became a new winter tradition and same was witnessing unfortunate fellows around getting the flu. I was routinely immunized and, darn it, still got the flu more often than not. There was little doubt that I could make the difference between the cold and the flu. The latter was infectious and will surface in a matter of days after contact. Well, life got surely more interesting – flu-wise – as soon as I had my first kid. He was a flu-magnet: got it from everywhere and shared it with everyone! Daycare was a true influenza-incubator. I mean, seriously, any RNA virus expert studying influenza needs to hold a part-time job in a daycare to understand the true dynamic of this infectious disease! I don’t know how Lowen, Mubareka, Steel, and Palese mastered their skills but clearly, it took them all until 2007 to crack the flu-story open for the entire world. Even worse, it took me other ten years to come across their manuscript! Believe it or not, it was madness, anger and frustration combined that helped me find this published evidence! Kiddo turned 15 this summer and continues being the same flu-magnet, then he shares it with all of us because, when you got the flu, you are contagious starting as soon as the next day. The flu will last a good whole week and, naturally, you will be contagious throughout this entire time. This last time though The Flu drained my last drop of patience. Let’s be clear: I know how to deal with it, I know what to do, I know what makes it better and worse, I know how to contain it within the house but – damn! – I had to understand at once what drives this winter-terror every year! So, I started digging after studies that I could trust. I wanted fine quality evidence that could guide the care I provide for my family, friends, patients everywhere. In a way, the “oops! You got it and have to deal with it” wasn’t what I was searching for. Well, I eventually found the one and only fine-evidence of how the influenza virus spreads. I should have expected it but it still surprised me: my grandmother has been right all along! The transmission of the virus was the most efficient at low relative humidity (under 50%) and basically non-existent at 80% or more. The virus stability in aerosols is limited, with its lifetime being extended by low temperatures and lower humidity. 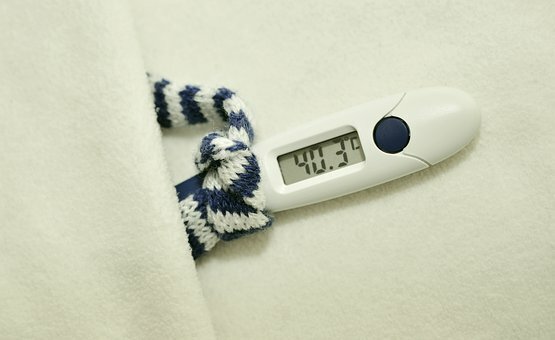 The influenza virus is highly efficient at 40 degrees Fahrenheit (5 degrees Celsius) and is BLOCKED at 86 degrees Fahrenheit (30 degrees Celsius)! Don’t believe it? Check it out here! Stunning evidence, mind-blowing enough to keep me quiet and thinking for a couple of good hours. Staying warm in the winter, combined with a good intake of vitamin C (antiviral+immune booster) and vitamin D (immune booster), AND good sleeping routine for adequate melatonin production will keep influenza at bay! Be selective in the making your decisions when shopping for vitamins, especially shopping for vitamin C. Remember that daylight stops melatonin production, so sleep on-time and a minimum of 8 hours. Not sure about you, but my gut guess is that the cost of medications needed to cope with flu is similar or higher than the difference in the heating bill. Hope you found this post informative. Share your thoughts below in the comments area and click like if you enjoyed the read. If you want to see how I prepared for the flu season, read my previous post. I’ll be back soon with details about how I managed our last fluventure (i.e. flu-adventure). Stay healthy in meanwhile!